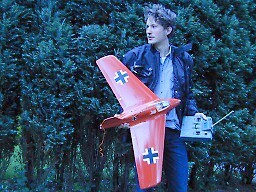 Emile van Essen is into building and flying RC tailles airplanes. 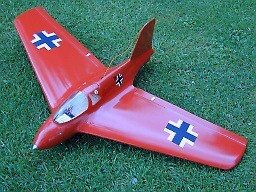 He built a Topp Me 163B semi scale model with a 955 mm span. The kit has an glass fiber/epoxy fuselage and foam/abachi wings, with a symmetric profile and 2 degrees of twist. The result of Emile's work is seen here! The model was originally designed to have a 3.5 cc engine, but instead it has a hybrid rocket engine runnig on N2O oxidizer and polyester fuel. 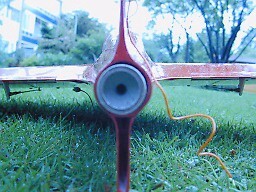 It can also be catapult launched for gliding flight. 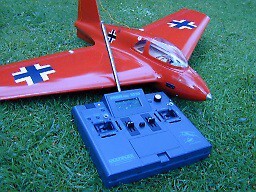 Emile chose to paint his model as Späte's red Komet on the first operational mission. The reason is simple; can you imagine the disadvantage of a properly painted camouflage scheme is on a small model in the grass..
Emile and his model. More photos can be found on Emile's site.